The Common Hatchetfish is not only an interesting-looking fish... but a freshwater fish that can fly! The Common Hatchetfish Gasteropelecus sternicla is a most unusually shaped fish. Its body looks like the head of a hatchet, thus the common name "hatchetfish." The term Gasteropelecus actually means "hatchet-shaped belly." The hatchetfishes of the family Gasteropelecidae leap from the water and fly through the air, flapping their large pectoral fins, to catch flying insects. They are generally accepted as being the only true "flying fish." A number of fish can leap out of the water, but only these freshwater hatchetfish actually use their pectoral fins to aid their flight. 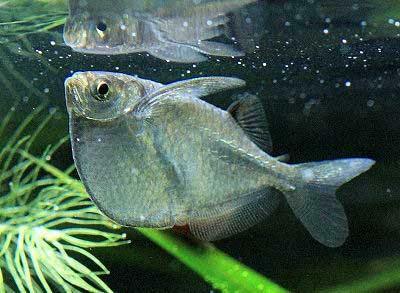 The Common Hatchetfish is also called the River Hatchetfish as well as Silver Hatchetfish. The name Silver Hatchetfish, however, is somewhat of a misnomer for this fish as a couple of other species are also known by this common name. In the same genera is the Silver Hatchetfish Gasteropelecus levis and another species of Silver Hatchetfish, Thoracocharax securis, which is also called the Greater Hatchetfish. These hatchetfish are all very similar in appearance, but they do differ in size. In the wild, both the Gasteropelecus species are smaller, with the Common Hatchetfish reaching about 1.5 inches (3.8 cm) and G. levis reaching about 1 inch (3.5 cm). The Greater Hatchetfish grows much larger, getting up to 3 1/2" (9.1 cm), a full inch longer than the Common Hatchetfish. The Greater Hatchetfish also differs slightly in looks because it doesn't have the pronounced black horizontal line often seen on the Common Hatchetfish. The confusion is somewhat alleviated for the hobbyist because the Common Hatchetfish is the one most commonly sold as the Silver Hatchetfish. Species of freshwater hatchetfish can fly a distance of more than 4 feet. Once they are in the air, they will move their pectoral fins like a bird's wings. The ability for the freshwater hatchetfish to fly is really astounding, but it is somewhat of a problem in the aquarium. The tank needs a tight fitting lid to keep these fish from leaping out of the tank to their demise. Common Hatchetfish are very peaceful, even timid fish, so they make good community tankmates. This fish likes to hang at the surface of the water and will appreciate some floating plants. However, as its mouth is situated on top of its body and it eats at the surface, be sure to also provide some clear areas as well to help it feed. The Common Hatchetfish must be kept in a well-maintained aquarium as it is prone to ich. The Common Hatchetfish Gasteropelecus sternicla was described by Linnaeus in 1758. This species is not listed on the IUCN Red List. They are found in South America in Brazil and in the southern tributaries of the Amazon. In Guyana and Surinam, they are found in smaller streams with plenty of vegetation. Other common names they are known by are River Hatchetfish and Silver Hatchetfish. In the wild, they prefer areas with an abundance of surface vegetation. The Common Hatchetfish can be found at the surface most of the time but will retreat occasionally if they feel threatened or when feeding. These fish can be seen flying many feet out of the water to catch flying insects. The Common Hatchetfish is a deep-bodied fish with a 'hatchet'-type shape to it. This fish will generally reach about 2 1/2 inches (6.5 cm) in length and has a lifespan of between 2 and 5 years. They will be more active and have a longer lifespan if kept in a good-sized group, ideally with 8 or more fish. These white or silvery-looking fish have a pronounced, black horizontal line running through the center of the body. They have a mouth situated close to the top of the head for feeding at the surface. This fish is sometimes confused with its close relative, the Silver Hatchetfish G. levi. However, knowing what species you have is usually not too difficult as the Common Hatchetfish is a bit larger than the other and also the one most commonly sold in pet stores. Size of fish - inches: 2.6 inches (6.50 cm) - In the wild, these fish only reach about 1 1/2 inches (3.8 cm), but aquarium specimens grow larger, up to about 2 1/2 inches (6.5 cm). Lifespan: 5 years - They have a lifespan of about 2 to 5 years. They will have a longer lifespan, and be more active, if kept in groups of 8 or more fish. The Common Hatchetfish is moderately hardy but recommended for aquarists with some experience. They are very susceptible to Ich, particularly when introduced to a new home. Newly acquired specimens should be acclimated in a quarantine tank before they are introduced into a community. Aquarium Hardiness: Moderately hardy - This fish is susceptible to ich, especially when first introduced to a new aquarium. These freshwater hatchetfish are carnivores that feed on crustaceans and insects in the wild. With their mouths situated at the top of their bodies, they are used to eating surface foods such as small vinegar flies and mosquito larvae. In the aquarium, the Common Hatchetfish will generally eat all kinds of live, fresh, and flake foods as long as the food is on the surface of the water. To keep a good balance, give them a protein such as brine shrimp (either live or frozen), fruit flies, or blood worms every day. Live foods (fishes, shrimps, worms): Some of Diet - Their diet should be supplemented with live foods daily. Hatchetfish are not exceptionally difficult to care for once acclimated provided their water is kept clean. Aquariums are closed systems, and regardless of size, all need some maintenance. Over time, decomposing organic matter, nitrates, and phosphate build up and water hardness increases due to evaporation. To combat these ever-changing conditions, water should be replaced on a regular basis, especially if the tank is densely stocked. At least 25 to 50% of the tank water should be replaced every other week. These fish are moderately hardy. A school of 6 or more fish will do best in about a 15 to 20 gallon aquarium. They will mostly swim and feed at the surface of the water. While they will appreciate some floating plants, they eat at the surface, so some clear areas need to be provided as well. The tank should be tightly-sealed as this fish is likely to jump out of the tank if provided the opportunity. These freshwater hatchetfish are prone to ich, especially when first introduced to a new aquarium. Any new specimens should be acclimated in a quarantine aquarium before being placed in their permanent home. This blackwater native is very intolerant of harder and more alkaline water. Water conditions should be kept soft and acidic for them to thrive. Peat filtration is advisable. Suitable for Nano Tank: Yes - A larger nano tank can be used to house a school. Water Region: Top - The Common Hatchetfish will swim at the top of the aquarium where it feeds. Notice how its mouth is situated at the top of its body. The Common Hatchetfish are generally good community fish. This fish is relatively shy, so it should be spared the company of hostile tankmates. It must absolutely be kept in a school. A minimum-sized school would be 6 hatchetfish, but 8 or more are ideal. If provided a good-sized school, they will be more active and have a longer lifespan. Good tankmates for this fish are tetras, dwarf cichlids, Corydoras, and Loricariids. Temperament: Peaceful - These fish are very nervous and timid, so monitor interactions with tankmates. Same species - conspecifics: Yes - They must to be kept in a school. Though 6 fish is the minimum, a school of 8 or even more is recommended. Slow Swimmers & Eaters (): Monitor - Characins can out compete them for food. The males and females can be difficult to tell apart, but if viewed from above, the female is slightly plumper. Common Hatchetfish are egg layers, but they have not been successfully bred in captivity. Interestingly, their cousin, the Marbled Hatchetfish Carnegiella strigata, though not quite as hardy, will breed quite easily. For a description of breeding characin fish, see Breeding Freshwater Fish: Characins. The Common Hatchetfish are prone to developing ick (ichthyobodo infection). This is especially true when they are first introduced to an new aquarium. Newly acquired specimens should be kept in a quarantine tank before they are introduced into a community. Even so, they will still be susceptible to ick if their tank water is not kept soft and acidic. As with most fish, these freshwater hatchetfish are prone to skin flukes, parasitic infestations (protozoa, worms, etc. ), parasitic infestations (protozoa, worms, etc. ), bacterial infections (general), and bacterial disease. 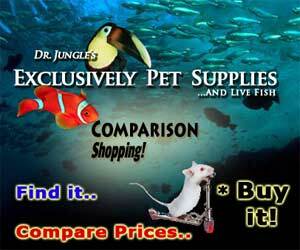 They are extremely hardy and disease is not usually a problem in a well-maintained aquarium. That being said, there is no guarantee that you won't have to deal with health problems or disease. Remember that anything you add to your tank can introduce disease. Not only other fish but plants, substrate, and decorations can harbor bacteria. Take great care and make sure to properly clean or quarantine anything that you add to an established tank so as not to upset the balance. A good thing about the Common Hatchetfish is that due to their resilience, an outbreak of disease can often be limited to just one or a few fishes if dealt with at an early stage. When keeping more sensitive types of fish, it is common for all fishes to be infected even before the first warning signs can be noticed. The best way to proactively prevent disease is to give your Common Hatchetfish the proper environment and a well-balanced diet. The more closely their environment resembles their natural habitat, the less stress these fish will have, making them healthier and happier. Stressed fish are more likely to acquire disease. Aquarists should read up on common tank diseases. Knowing the signs and catching and treating them early makes a huge difference. For information about freshwater fish diseases and illnesses, see Aquarium Fish Diseases and Treatments. The Common Hatchetfish is readily available. They are somewhat more expensive than their cousin, the Marbled Hatchetfish Carnegiella strigata, but the Common Hatchetfishs' comparative hardiness makes them worth the extra price. I have 2 hatchet fish in a 75 gallon planted tank. After reading this I'm going to get more. I took my heater out after a malfunction where I lost most of my fish. My aquarium has been without a heater for four years with no problems. My water is in perfect balance and the temp stays at the lower end of normal in the winter. With that said my aquarium is heavily planted which may be a factor. my mum loves these fishes mouths! im going to get her some as present when i get my tetra tank! They are very cool fish, and fairly hardy. Best to make sure you get enough of them though, and have plenty of space so they can get out of each other's way if one decides to be belligerent. While I was down collecting in Bolivia last year, I happened upon a large shoal of these in the Rio San Martin. I will have to say, the Wild living relatives of our Aquarium inhabitants can grow to huge proportions! Not only that, they really can skim across the water top to great lengths! A tight fitting lid -- definitely, and if you have one, a Canopy even better.